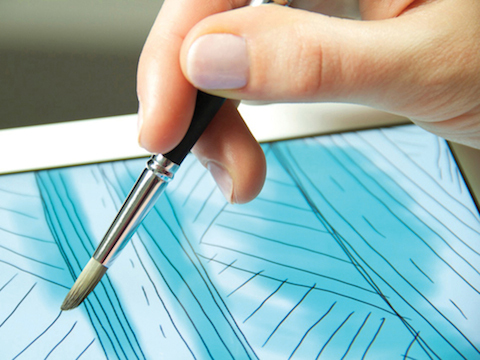 This tool is both a stylus and a paintbrush. It is for use with devices equipped with capacitive screens, like iPads. Made of tapered synthetic bristles with conductive properties, the brush head gives a satisfying sense of resistance yet moves across the screen easily. When removed, the protective cap serves as a well-weighted paintbrush handle, when the cap is replaced, the brush becomes a sleek rubber-tipped stylus.